The public, I have learned over the years, forms its judgments mainly through interactions with other people, through dialogues and discussion. People weigh what they hear from other against their own convictions. They compare notes with one another, they assess the views of others in terms of what makes sense to them, and, above all, they consult their feelings and their values. The public doesn’t distinguish sharply between facts and values, as journalists and social scientists do. Yankelovich draws his illustrations from foreign and domestic political affairs with a watchful eye on three critical moments of Dialogue: an acceptance of equality between the parties, an attempt at listening with empathy, and a willingness to surface any assumptions. Furthermore, he reinforces William Isaacs’ distinction between debate and dialogue by underscoring debate’s combative nature and dialogue’s collaborative spirit. Among the highlights of this highly readable volume are sections which form the core a cogent instruction manual for Dialogue: The 15 strategies of successful dialogues, which include tips for gaining and maintaining trust and for clarifying communication barriers, and the 10 potholes of the mind, which identify egocentric, prejudicial, or unfocused behaviors that negatively affect Dialogue. In Dialogue and the Art of Thinking Together, William Isaacs extends Dialogue theory to its practical applications. Identifying pathologies of thought (abstraction, idolatry, certainty, and violence), Isaacs unearths counterbalancing principles of Dialogue (participation, coherence, awareness, and unfolding) and their corresponding practices (listening, respecting, suspending, and voicing). Like his mentor David Bohm, Isaacs carefully defines key terms and outdoes the master when reaching into his seemingly endless reserve of rich illustrations from history, popular culture, other cultures, literature, music, philosophy, management, and organized labor to sharpen his focus on the clear distinction between Dialogue and other forms of human communication. Isaacs also freely draws parallels with other ideas, such as David Kantor’s four-player system (mover, follower, opposer, and bystander), to press a case for the value of each personality type in the communication continuum. His new capacities for behavior diagrams crystallize the roles of each player in Dialogue, and his prose elaborates on each player’s intents and potential communication shortcomings. Hours go by and it seems only minutes have lapsed. It is very difficult to interrupt dialogues that are in space when the pressure of kronos (real time) arises. That kind of writing will sell readers on trying to experience Dialogue for themselves. Isaacs’s accessible style makes for the perfect companion piece to Bohm's On Dialogue. In fact, his exhaustive associations between theory and technique render Dialogue and the Art of Thinking Together the ultimate handbook on the subject. David Bohm’s legacy crosses the worlds of science and language. His championing of a causal interpretation of quantum physics led to lengthy conversations with Einstein, but it won him little respect among most scientists, who preferred the orthodox indeterminate approach espoused by Niels Bohring and Werner Heisenberg, the Copenhagen School theorists (and subjects of Michael Frayn’s Tony Award-winning play Copenhagen). In the early 1950s, Bohm stood fast against Senator Joseph McCarthy’s anti-Americanism inquiries, which seriously damaged his professional standing in the United States and caused him to live and work abroad until his retirement in 1987 and his death five years later. Perhaps it was his insistence on seeing order in the universe or his deep principles in the face of McCarthyism that inspired Bohm to fashion his paradigm about the implicate order and undivided wholeness, through which he cogitates with remarkable lucidity about humanity’s transcendence beyond individual and collective domains to an immersion in a cosmic dimension. This unique fusion of science and society resides at the center of Dialogue, and Bohm devotes substantial space to it in On Dialogue, a slim and engaging treatise. Thought should be able to perceive its own movement, be aware of its own movement. In the processes of thought, there should be the awareness of that movement, of the intention to think, and of the result which that thinking produces. A seminal manifesto on communication breakthroughs, Bohm's book provides just the theoretical grounding that a Dialogue neophyte would need to venture into this provocative terrain of how we mean—a question general semanticists pose assiduously. 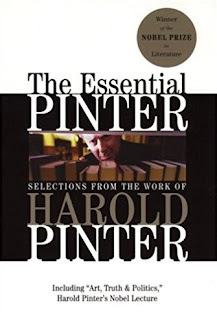 BOOK BRIEF: "The Essential Pinter: Selections from the Work of Harold Pinter"
I remember reading one of my favorite writers, Harold Pinter, on the eve of my wedding at age 22. As tomorrow marks my fortieth wedding anniversary, I remain struck by how Pinter's method and themes, if anyone has ever adequately described them, reflected my life and mindset then, and still does. The ideas he expresses have always been rooted in my pathos, and they surface for the first time when his characters utter them. Forty years ago today, I was living in a 500-square-foot, one-bedroom basement apartment in the Bronx, just a four-block walk from the noisy 180th Street train station, whose tracks ran behind a high concrete wall topped with barbed wire to the noisy 180th Street train station. In one semester, I would graduate with a B.A. in English from the City University of New York. My earnings as a part-time taxicab driver and homework tutor for a social services agency were not much more than $100 a week, which was not bad considering my rent was only $100 a month and the subway was 50 cents a ride. But my prospects of becoming a high school English teacher were dimming at a time when the New York City Board of Education was not hiring because of budget problems. The new responsibilities of becoming a husband, college graduate, and licensed teacher were weighing on me. Yet without any good reason, I thought somehow everything would turn out all right. Even back then I knew that life was inexplicable. Just six years earlier, at 16, my ambitions as a denizen of the James Monroe housing projects were like those of many of my friends: to drop out of high school, find a job for six months, and figure out a way to get fired so that I could collect unemployment. I certainly had no idea that I would find a job with a nonprofit organization, where I would stay for 19 years before running my own communication consulting business for the past 20 years. I saw my first Harold Pinter play at the Classic Stage Company's 1973 production of The Homecoming. I was 19, in my second year of college, liberated by having changed majors from business to English. I believed that since New York City was in its worst fiscal crisis ever, I had nothing to lose by focusing on what I loved. Sure I might not find a job right away. But why chase after a career I would later regret? What I saw on stage that evening hypnotized me. I had no idea what these characters were talking about, but I knew every word was meaningful. Without seeing any overt act of violence or hearing one subversive statement, I was certain I had witnessed the most disturbing sort of subversive violence, the kind we either don't recognize or dare not acknowledge as violence. Without completely understanding the dialogue, I believed that the actors' words could not be more real. I walked away from that theatrical experience transcendent, realizing the limitless potential of drama to depict the human condition. I have measured every other play I've seen since The Homecoming against that standard. Is this a review of Pinter's work? You bet. I cannot separate the very details of my life from The Caretaker, The Homecoming, Old Times, No Man's Land, Betrayal, Family Voices, Moonlight, and many of Pinter's other plays and sketches. His dramas unfold as my life has, does, and likely will. The Essential Pinter: Selections from the Work of Harold Pinter offers a good starting point if for those new to this playwright's playwright. It includes a sufficient sampling of his plays to make readers want to discover more of them. The poetry does not reach the same level as the drama, but this volume also includes Pinter's defiant 2005 Nobel Prize controversial and underappreciated acceptance speech.